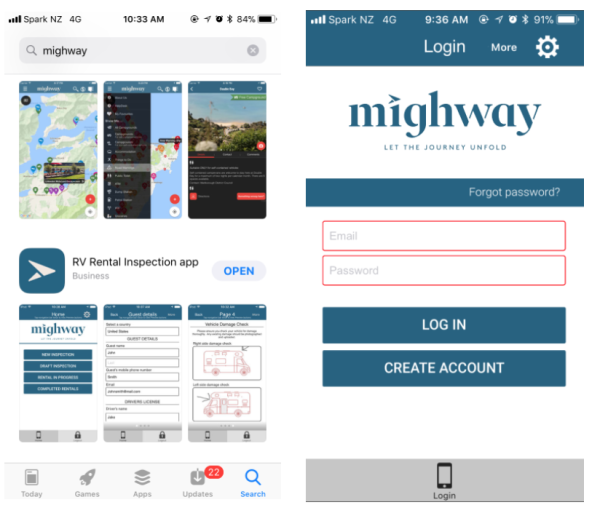 It's mandatory that you download Mighway's RV Rental Inspection App, to manage an easy pick-up and drop off process. Available on both Android and Apple devices. 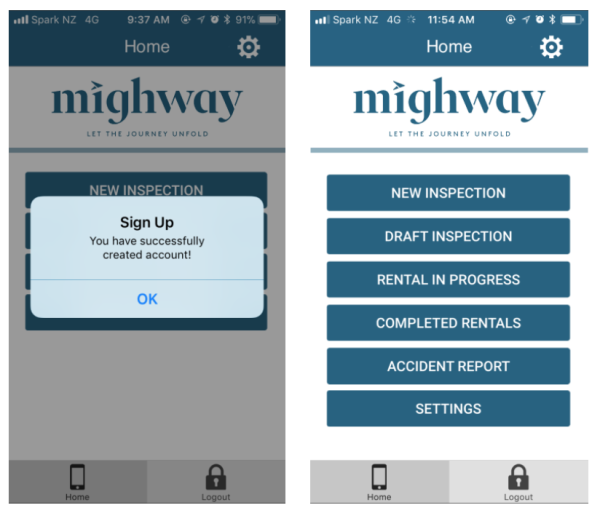 Step 1: You can download our Rental Inspection App to manage pick up and drop off, available for both Android and Apple. 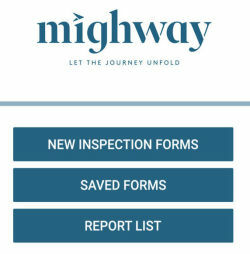 Simply type in "Mighway" to find the RV Rental Inspection App, with the Mighway direction logo. Step 2: Once you have downloaded the app, you will be prompted to login or create an account. You will need to create a new account before logging in as this is separate to the Mighway owners' portal login. If it's easier, you can use the same email and password you have used for the Mighway's owners portal, to create your new account. Step 3: Hooray! When you have successfully created an account, you will be prompted with a notification. Press "OK" to continue. Step 4: Your menu screen will look like this. To begin the pick up process, please click "New Inspection". The "New Inspection" process consists of 4 pages that you will need to thoroughly complete with your guest, upon pick up of your vehicle. Step 5: The first page requires you to complete all guest details. It's important that you physically check the driver's Drivers License, entering their first and last name, license number and uploading a photo of their license, and any additional drivers. 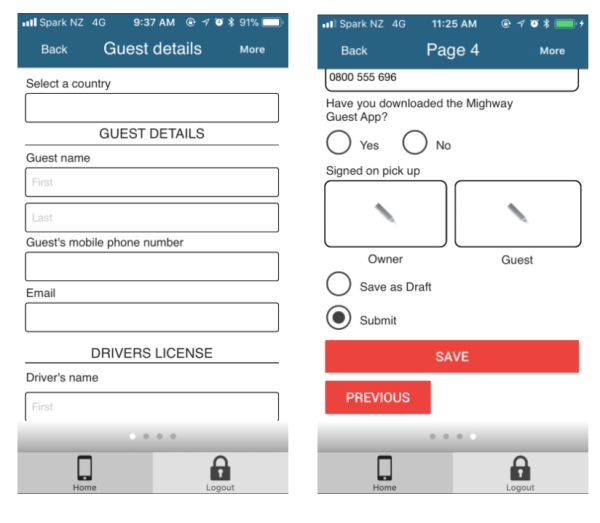 You will need to enter your guest's travel details, including pick up/drop off dates and times, your vehicle details and Road User Charges required. Once you have completed this page, click "NEXT" to continue to page 2. Step 6 (optional): If you need to save this inspection at any time, please proceed to page 4 and select "Save as Draft", and click the "SAVE" button. Your information will be automatically saved, and you can return to complete this again, by returning to the home page and clicking "DRAFT INSPECTION". You will see your draft inspection saved here, which you can complete when you're ready. 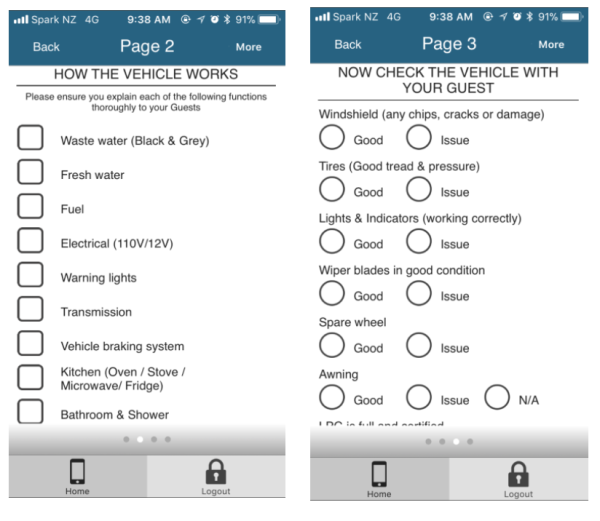 Step 7: Page 2 requires you to complete all checklists on "How the Vehicle Works". Please ensure you explain each of the following functions thoroughly to your guests. Click "NEXT" to continue to page 3. If any fields are not applicable to you, please tick the checkbox regardless and continue. 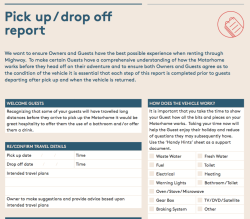 Step 8: Page 3 requires you to complete the condition of your vehicle with your guests. Please ensure you complete all checklists before continuing to Page 4. 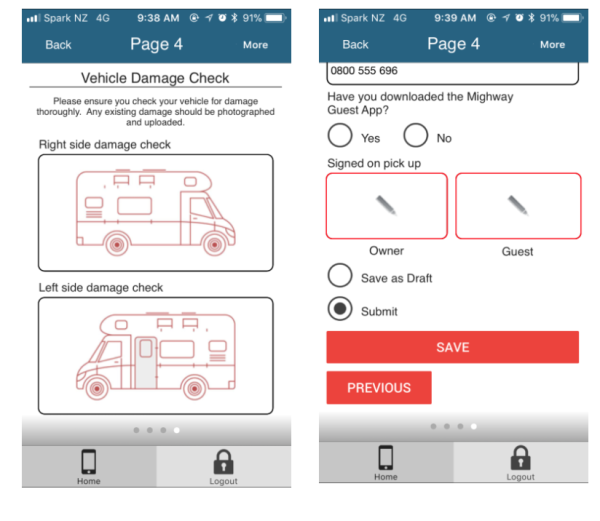 Step 9: Page 4 requires you to further complete the condition of your vehicle with your guest. Please ensure you complete all checklists. If there are any additional inventory items, please ensure you update this accordingly. Page 4 also requires you to complete a "Vehicle Damage Check". Please ensure you check your vehicle for damage thoroughly. Any existing damage should be photographed and uploaded. Step 10: It is mandatory that you and your guest sign, as this is an agreement on the details that have been recorded. Once you have completed the process, you can select the "submit" field and click the "SAVE" button. 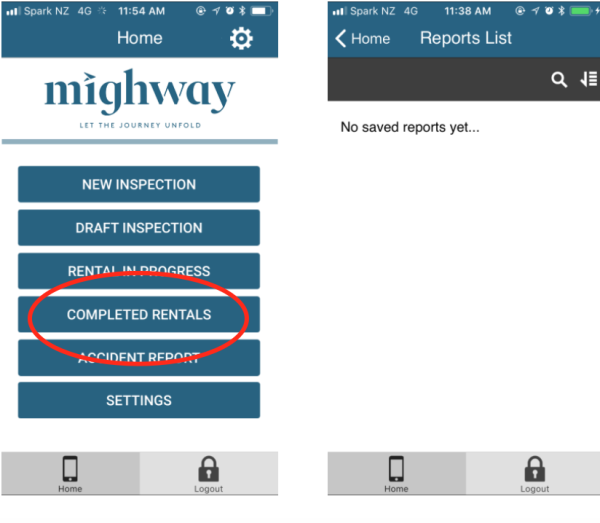 Your completed pick up inspection can now be found under "RENTAL IN PROGRESS" on the home screen. Step 11: When your guest returns from their trip, select "RENTAL IN PROGRESS" and complete the drop off process as detailed above. The form will now automatically be sent to your email address and to the Mighway team. You can also find your completed inspection forms in "COMPLETED RENTALS". Step 12: Once your guest has completed their journey, you will find the rental inspection in "COMPLETED RENTALS". Step 1: In the unlikely event your guest has an accident, please click the "ACCIDENT REPORT" button on the homepage and click "CREATE ACCIDENT REPORT". Here, you will fill out the form in the event of damage to your vehicle. To maintain insurance coverage it is important that the information is complete and as detailed as possible. 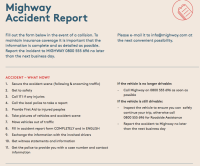 Report the incident to the MIGHWAY team by calling 0800 555 696 no later than the next business day. Click "NEXT" to proceed to page 2. Step 2: Fill out all details on page 2 of the rental agreement. Click "NEXT" to continue to Page 3. Step 3: Fill out all details on page 3 for "OTHER VEHICLE/PROPERTY". Click "NEXT" to continue to page 4. 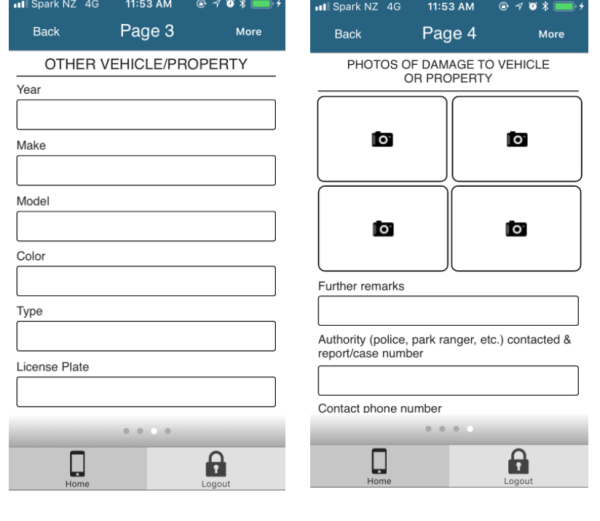 Step 4: Fill out all details on page 4 for "PHOTOS OF DAMAGE TO VEHICLE OR PROPERTY". The driver/guest will need to sign to certify that the information provided is true and correct to the best of their knowledge. Please click "SAVE" once completed. You can find the completed accident report under "COMPLETED ACCIDENT REPORT". Once you have completed the process, you can click the "submit" button and "SAVE". Your accident report will be in "COMPLETED ACCIDENT REPORT". 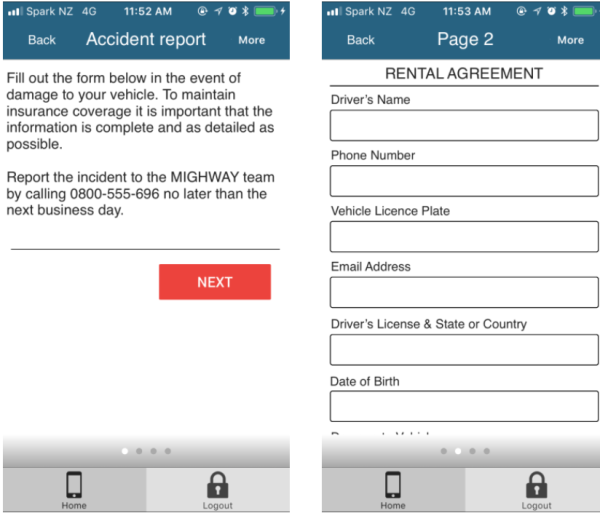 Once you have completed the accident report form you will receive confirmation from the Mighway team and our insurance partner, Camper Care, who will contact you regarding your claim. 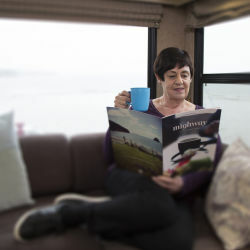 Scroll below to find all our Mighway Owners Documents, including our updated pick-up and drop-off forms!